Getting a laptop to use at college can seem like a right of passage for high school graduates, but with a congested market featuring hundreds of options from dozens of manufacturers, choosing which device to purchase often becomes a complex issue. Generally, college laptops must possess a minimum of 4 GB of RAM to handle basic software and wireless internet capability to make sure you can stay connected across campus. Nearly all modern laptops come standard with these features, so where do you go from there? It depends on your personal priorities. Some students may need to focus on a low price above all else. Others may want a large, high-definition screen, versatile configurations and folding hinges, or a large amount of onboard storage space. Fans of certain operating systems or tech manufacturers may decide to narrow their options that way. The ideal college laptop, ultimately, is the laptop that works best for you and your needs. Continue reading on for a look at 25 of the best options currently available. These laptops represent a variety of manufacturers, price ranges, operating systems, tech specs, and versatility features to help you fully explore your options. For a starting price of only $399, the Microsoft Surface Go packs a powerful, ultra-portable punch. As the name implies, the small 1.15lb device boasts a design built to go along for the ride, featuring a 10'' touchscreen which can be used as is with your finger or in conjunction with a Surface Pen, which is sold separately. The Surface Go's 4GB of memory and 128GB of storage space provide ample speed and space for college students to complete online research, assignments, emails to professors, and video calls to friends. Microsoft Surface Go also allows students to detach the keyboard completely, making it possible to use the device in a myriad of ways. Take notes and complete assignments with the traditional laptop, watch videos and movies with the keyboard employed as a tabletop mount, or take photos and play games with the handheld tablet. The latest version of the Microsoft Surface Pro starts at $799, but eligible students can receive a special $719 rate by making their purchase from the online Microsoft store. The base model offers a 128GB solid state drive for storage, 4GB of memory, and a speedy 7th generation Intel Core m3 processor. Use the 12.3" touch screen as a tablet or connect the keyboard for use as a laptop. The 1.69lb Microsoft Surface Pro comes standard with LTE capability to let you stay connected wherever you go, even without wifi. Just insert a SIM card and choose a data plan from Microsoft or your preferred mobile provider. With up to 13.5 hours of battery life on Wi-fi and 12.5 hours on LTE, college students can enjoy using the Surface Pro all day around campus without needing to charge it. Priced at $1,999.99, the LG gram might steer some students away based on budget concerns alone, but this laptop's price reflects the powerful tech found inside and its durable exterior. The LG gram boasts 16GB of dual-channel memory, 1TB of storage, and an 8th generation Intel Core i7 processor. With these specs, students can feel free to multitask, run memory-heavy programs for work or pleasure, and store thousands of files without limiting the speed of their laptop. The demands of college can be rough on students and their devices, but the LG gram comes prepared for anything, having passed seven industry durability tests against temperature and pressure changes, vibrations, impact/shock, and even dust and saltwater spray. Despite the military-grade makeup and 15.6" touchscreen, the laptop weighs less than 2.5lbs., making it a viable option for on-campus portability. Get up to 16 hours of battery life on a single charge with this ENERGY STAR certified PC. Settled comfortably between budget laptops and premium devices, the HP Spectre x360 starts at $1,149.99. Installed with a Windows 10 Home 64 operating system, this convertible laptop contains an 8th generation Intel Core processor, 8GB of memory, and 256GB of solid state drive storage space. These tech specs make for a perfect, versatile college laptop that can handle in-class duties, research, homework, and leisure with equal efficacy. The 13.3" touchscreen offers a clear viewing experience, whether you choose to use it as a laptop, tabletop tablet, or handheld tablet. No matter your notetaking preference, the HP Spectre x360 has you covered. Enjoy traditional note taking with a digital pen, or use the full keyboard to type during lectures. Made by China-based manufacturer Huawei, the MateBook X Pro might lack the American brand recognition of computers made by Dell, Apple, or Microsoft, but the tech specs of this notebook competes with the best of them. At a moderate retail price of $1,199.99, the MateBook X Pro packs 256GB of storage, 8GB of memory, and a battery that can handle up to 12 hours of continuous 1080p HD video playback. Further enrich your after-class movie or video streaming with bass subwoofers and immersive 3D sound from built-in Dolby speakers. Although this 3.9-lb notebook possess a 10-point touchscreen, it lacks the popular convertible features of a detachable keyboard or 360-degree flip hinges, making it an ideal traditional option for college students who want a no-frills, reliable, powerful laptop for their work and play. Starting at $1,199, the Asus ZenBook S is built to handle the college experience. With 8GB of memory and a 256GB solid state drive, the Asus Zenbook S provides more than ample speed and storage space for coursework and personal enjoyment after class. The 2.2-lb ZenBook S boasts easy portability and meets military-grade standards for reliability and durability in temperature, altitude, and humidity conditions tests as well as vibration/drop tests. To set it apart from the competition, the Asus ZenBook S comes standard with several features designed for ultimate user comfort. Asus Eye Care technology reduces blue light by up to 30%, lessening the strain on eyes during those late night studying sessions. An ergonomic keyboard with the exclusive 5.5-degree ErgoLift hinge improves typing position in addition to optimising the system's cooling fans and enhancing audio performance. Users can also connect with Amazon Alexa to expedite daily tasks, access information, and control connected smart devices. Weighing in at 3.34lbs., the Microsoft Surface Book isn't quite as sleek or portable as comparable devices in the $1,499 retail price range, but what it lacks in featherlight transportability it makes up for in versatility. The base model comes equipped with 8GB of memory, 128GB solid state drive storage, and a 6th generation Intel Core processor for quick and efficient multitasking. Use it as a traditional laptop, carry it as a handheld tablet, prop it up on a flat surface for viewing, or fold it into Studio Mode to draw with the included Surface Pen. True-to-life color and high resolution on the 13.5" PixelSense™ display provides an excellent option for watching full-screen video playback and an ideal workspace for design students. Whether you want to work on a project or kick back in your dorm room, the versatile Microsoft Surface Book rises to the occasion. You don't need to break the bank to get a laptop with versatile features and hardware built to handle the demands of college coursework. The Asus Chromebook Flip clocks in at only $498 and functions in a variety of useful modes thanks to its 360-degree hinge: tablet, tent, laptop, and stand. The Google-designed Chrome OS offers seamless connection with thousands of apps in the Chrome Web Store, and each Chromebook Flip comes with 100GB of free Google Drive space for two years, ideal to supplement the small, 32GB onboard storage space of the base model. You can also upgrade to 64 or 128GB of onboard storage for an additional cost. 4GB of memory, a 6th generation Intel Core processor, and a battery life of up to 10 hours round out this 12.5" touchscreen device. The Samsung Notebook 7 Spin offers versatile tech and features at a mid-range base price of only $899.99. The high-definition 13.3" LED display screen does not detach for use as a true tablet, but the 360-degree hinges allow for a variety of physical configurations including use as a laptop, a supported base and screen for tabletop viewing, or folded over completely for a tablet feel. In a lecture hall, take notes with the keyboard, use the active pen (sold separately) to make a sketch, or utilize voice note to record audio and set active bookmarks for later review. The 8GB of memory, an 8th generation Intel Core processor, and 256GB of solid state storage space ensure a busy college student can multitask, run all necessary programs, and save plenty of files for personal or class use. Work from anywhere with a backlit keyboard and 9.5 hours of battery life. Complete with a battery life of up to 12 hours, a 13.3" full HD display, 8GB of memory, and 256GB of onboard storage, the Samsung Notebook 9 packs a ton of top features into a base price of only $999.99. The forged aluminum and magnesium build provides for durable, lightweight portability at just under three pounds. The Notebook 9 also features versatile hinges which allow a 180-degree spin into tabletop tent mode or flat tablet mode. Whether you want a second way to keep in touch and communicate, or if you simply find it too difficult to keep your phone put away during class lectures, Samsung fans can even sync their Galaxy smartphone to share files, receive calls, and text friends straight from their laptop screen. With hardware built to handle the demands of coursework, group projects, and after-class Netflix binges, the Samsung Notebook 9 makes for an excellent college laptop. The 14 inch Lenovo Yoga 920 retails for $1,549.99, with payment plans available for as low as $27/month. An 8th generation Intel Core processor and 8GB of memory keep things running fast, whether you find yourself working through class lectures, multitasking between apps to complete a project, or watching videos on the stunning 4K display. Including 512GB of onboard storage, the Lenovo Yoga 920 offers ample space to keep track of assignments and personal files, while the watchband hinge allows for smooth transitions from laptop to tablet or tabletop mode. Factory installed with Windows 10 Home, the Lenovo Yoga 920 offers the revolutionary Windows Ink feature. With one touch of the Lenovo Active Pen 2 (sold separately), you can make handwritten annotations on anything from videos to web pages to powerpoint slides, and draw, color, and design artwork. When it comes to laptops for college students, the 13 inch MacBook Pro stands out among Apple's other offerings. Priced at $1,799 for the base model, this powerful, portable machine costs up to $1,000 less than the 15in. version. The MacBook Pro comes standard with 8GB of memory, a 256GB solid state drive, and an 8th generation Intel Core processor. An LED Retina display enhances viewing experiences while the Pro's exclusive Touch Bar at the top of the keyboard creates a fun feature for added control: move faster through browser tabs, easily rewind a movie, and adjust volume or brightness. Designed for user friendliness, Apple's OS rarely hangs up or crashes, and a well cared for Apple laptop can last well beyond four years at college. Weighing just under five pounds, the Acer Aspire E doesn't hold up to the easy portability of sleeker laptops, but other features may make up for this shortcoming. The Aspire E base model's 15.6in. screen size provides a massive amount of space, ideal for graphic design students who need a large workspace. The bulk of the laptop also holds a DVD drive and an SD memory card reader, both increasingly hard-to-find features in modern laptops. The 1TB hard drive provides space for countless files, and 8GB of memory help maintain a speedy system. Overall, the Acer Aspire E provides a throwback feel with modern hardware, perfect for everyday computing. Starting at a retail price of $549, this laptop goes easy on your wallet, too. The 13 inch MacBook Air offers fewer bells and whistles than the flagship Apple laptop, the MacBook Pro, but at a starting price of just $999, it makes for a solid college laptop for fans of Apple products. Additional features which set it apart from the MacBook Pro include two USB ports rather than the Pro's Thunderbolt ports, which require attachments or adapters for use with some accessories. Weighing three pounds, the MacBook Air has a bit more heft to carry than other 13" laptops in this price range, but it boasts the reliability and ease of use common with Apple tech. A Macbook Air also comes with 8GB of memory and 128GB of storage standard. Students with iPhones can connect their mobile number to the MacBook Air as well, making it possible to receive and send iMessages and texts, answer phone calls, and use FaceTime from either device. At 15 inches, the touchscreen display of the Lenovo Flex sits on the larger side of the spectrum, with features made for entertainment. Full HD technology provides vivid detail when streaming movies or simply browsing the web. Thanks to the 360 hinge, the Flex can fold into a variety of configurations to optimize user experience, including laptop, tablet, and tent mode. Enjoy clear, immersive sound from Dolby Audio Premium, complete with an advanced sound leveller and volume maximizer. Though it certainly works to enhance video and audio, the Flex delivers on more than just surfing the web and streaming media. An 8GB memory, 500GB hard drive, and all-day battery life make this 4.4 pound laptop an excellent candidate for running software, taking lecture notes, and completing projects. Enjoy a college experience full of digital entertainment with this $789.99 laptop. Whatever mode you decide to use the Acer Chromebook R11 as -- tent, stand up, tablet, or a traditional laptop -- the 360-degree hinge provides a smooth and stable transition. The low $329.99 retail price of this Chromebook stems from its low-capacity solid state drive, which allows for only 32GB of onboard storage. On its own, the hard drive should easily handle Word documents and PowerPoint presentations, but with external hard drives becoming ever more affordable these days, storing more, larger files shouldn't create too much of a hassle. Students can carry the 2.76lb. laptop to class for notetaking and use an external hard drive back at their dorm to store and manage files. While 4GB of memory might not keep pace with intense software multitasking, but this sleek, convertible laptop can handle the necessities of college life, making it a perfect option for a student on a tight budget. The Samsung Chromebook Plus retails for $499.99. Interest-free financing from Samsung's online store allows for six monthly payments of $83.33, making this an ideal laptop for a college student on a budget. Its 4GB of memory and a Hexa-core processor made especially for Chromebooks provide plenty of kick to keep up with the demands of multitasking. Use the included stylus pen and preinstalled Art Canvas software to draw on the 12.3" LED touchscreen in tablet mode, or take notes and complete assignments in the traditional laptop mode. Although 32GB of onboard flash storage won't handle a large number of files, purchasing an affordable external hard drive easily bypasses this issue. This budget laptop weighs less than 2.5 pounds and features a spill-resistant keyboard -- a truly portable option you can take anywhere on campus, even the dining hall. With a retail price of only $999.99, the HP Envy 13t comes dressed to impress with a stunning all-aluminum design, 8GB of onboard memory, an 8th generation Intel Core processor, and a 256GB solid state drive. The storage capacity and system speed provide smooth sailing through the demands of college courses and digital recreation like streaming and gaming. The 13.3" ultra HD display pairs well with a full-size keyboard and an elevated hinge designed to promote a comfortable, ergonomic typing position. Running late for class? The Envy 13t comes equipped with HP Fast Charge, which is capable of going from 0% to 50% in 45 minutes, with a full charge lasting up to 14 hours. This laptop doesn't fold and twist on a convertible hinge, but the HP Envy 13t remains a solid option for any college student. The ultra-portable Asus VivoBook E203MA weighs only 2.2lbs., is less than an inch thick, and boasts a petite but powerful 11.6" HD screen. Asus Tru2Llife Video technology optimizes each pixel on the display to enhance and enrich colors, whether you're browsing the web, watching videos, or creating a presentation. A 180-degree hinge makes this laptop capable of extreme angles, including laying completely flat on a tabletop. While 4GB of memory won't support intense multitasking, it easily manages common college software and apps like Microsoft Office and Evernote. Easily supplement the 64GB of onboard flash storage with an external hard drive or even an microSD card, which can be inserted into the laptop's port for a permanent storage solution. At a retail price of only $229, the VivoBook holds its own as a quality budget laptop for college. Optimized for the Windows 10 Home operating system, the Dell XPS has remained one of the top college laptop options for years. The Dell XPS 13 model, recognized as a 2018 Innovation Honoree by the Consumer Electronics Show for eco-design and sustainable technology, retails for $899.99. College students get plenty of power and space for coursework with this laptop's 4GB of memory and 256GB of onboard storage, and features like Dell Cinema's vibrant color, clarified audio, and bandwidth maximizer are ready to help you unwind after class. At 2.68lbs., the Dell XPS 13 is one of the lightest 13" laptops on the market, but inside the sleek construction it packs in a battery that can last up to 19 hours, revolutionary GORE thermal insulation, and an assortment of ports (USB, microSD, Thunderbolt) for quick connectivity to all your devices. 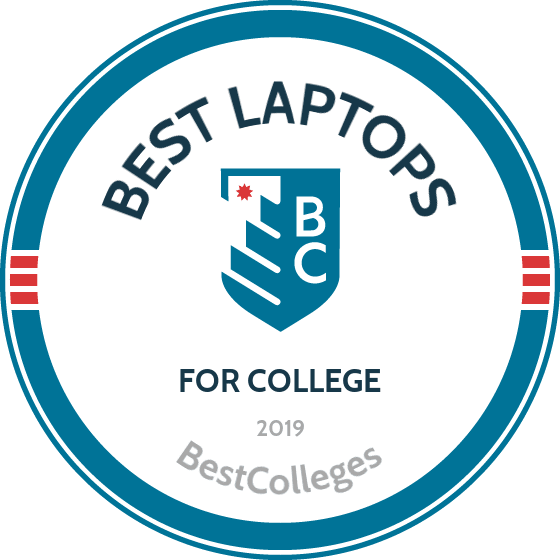 When it comes to choosing a laptop for college, a typical student may focus on preferences like versatility; a convertible display; or a smooth, user friendly OS interface. For a gamer entering college, however, laptop priorities might lean toward the quality of a graphics card or the immersive level of audio. If this sounds like you, Dell's G5 Gaming laptop fits the bill. Understandably, you may choose not to carry the 15.6", 5.84lb. machine to class, but its 8GB of memory, 256GB of storage, NVIDIA GeForce GTX 1050 Ti graphics card, and features like huge cooling vents and an 8th generation Intel Core processor mean you can both power through homework assignments and battle enemies with ease. The high-powered features on this laptop lead to a retail price of $1,048.99, but Dell offers no-interest, 12-month special financing when you make your purchase from their online store. For more than two decades, the Dell Precision 5520 has enhanced the digital workspace experience. The latest model -- sleek and portable at less than four pounds -- features a 15.6" full HD, anti-glare LED display. With the nearly borderless InfinityEdge, your view of the Windows 10 Pro OS interface has never been so good. The Precision 5520 comes standard with ideal hardware specs for college and beyond: 8GB of memory and 500GB of onboard storage space. Further improve productivity in your assignments, research, and class projects with the Dell Precision Optimizer, which automatically adjusts your laptop settings to run applications as fast and smooth as possible. A three cell Lithium ion battery, equipped with ExpressCharge capability to boost up to 80% in an hour, lasts for hours and comes with a three-year warranty from the date of purchase. The Dell Precision 5520 workstation retails for $1399.99. Among the growing fleet of Google Chromebooks, the Acer Chromebook 15 offers a solid college laptop option, although students may decide to invest in a microSD or USB external hard drive to supplement the standard 32GB onboard solid state storage and make room for more files. Additional tech specs include 4GB of memory and an Intel Pentium processor whose speed clocks in at 1.10GHz. To accommodate a 15.6" full HD LED touchscreen, the Acer Chromebook 15 weighs approximately 4.3lbs., a bit heavier than other notebook options of this size, but at a starting price of only $399.99, students on a budget who want a larger screen may not mind carrying the extra pounds. If your priorities focus on an ability to get homework and assignments done with ease, this reliable Chromebook makes an excellent college contender. Get a powerful Windows PC at a pleasantly low price of $519.99 from HP. While the HP laptop lacks popular versatility features -- you won't find a touch screen, 180- or 360-hinge on this device -- it packs technical specs that handle all the rigors of college life. Store every personal and class-related file you own with room to spare on the 1TB hard drive, and never feel bogged down while you multitask or stream media thanks to 8GB of memory. This laptop boasts a large 15.6" HD screen, though its corresponding 5lb. weight may make it a less portable option. If you do decide to tote it across campus, its battery life of nine hours won't let you down halfway through the class day. The HP laptop offers fewer bells and whistles than others on the market, but it provides reliable tech for college students who need a mid-range price. The Acer Aspire 1 takes a slim approach to everything: tech, size, and price tag. This true budget laptop costs only $219.99 and makes an excellent college companion for the student who simply needs a portable computer for note taking, essay writing, web browsing, and sending emails to group project partners. The Aspire 1 holds only 32GB of onboard flash storage and 4GB of memory, though students can easily supplement their storage space with a separately purchased SD card or external hard drive. A standard 14" HD screen provides graphics with ample detail and color, while BlueLightShield technology performs slight hue and brightness adjustments to protect your eyes during late nights. Don't worry about run time when you carry the 3.64lb. Acer Aspire 1 across campus. The two cell Lithium ion battery comfortably withstands up to nine hours of use per full charge. The 25 laptops included in this list are ranked according to three equally-weighted criteria: portability, hardware, and versatility. Portability scores take size and weight into account. Hardware score factors include memory, onboard storage space, and processing speed. Versatility scores consider a variety of areas, including the physical versatility of the laptop's design and the variety of activities one could accomplish with the device, including touch screen pens for design work, processing speed for gaming, or enhanced visuals for streaming media. Each criteria, ranked 1-5, contributes to a composite ranking score. These final numbers range from 7.5 to 12.